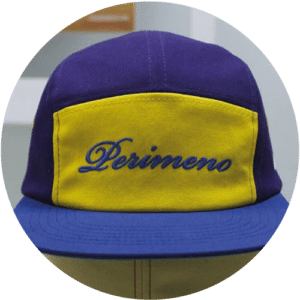 The cap of the day is a custom camp 5 pannel cap, featuring a rectangular front panel giving the opportunity to use any kind of embellishment option such as prints, embroideries of all kinds and patches. This shape is now also used by casual/high end brands thanks to its laid back fit. 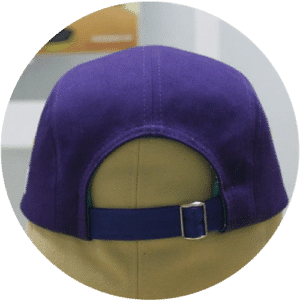 Made entirely of cotton, this cap features a self fabric strap with a silver slide buckle. 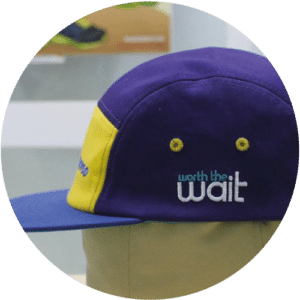 Let’s focus on the exterior, we’ve used no less than 3 different colors on this custom camp cap; yellow for the front panel and thread eyelets, purple for the crown and a nice bright blue for the visor and closure strap. Thanks to their unique construction, it’s very easy to play with different colors on this shape. 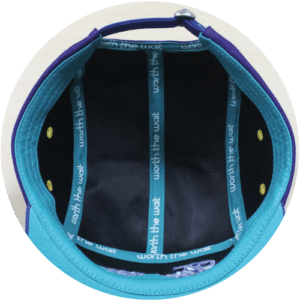 A flat embroidery was added on the front as well as on the left side of the caps. As long as the inside is concerned, the client went for a contrast teal blue tapping with white print.